Canada has the highest rate of multiple sclerosis in the world. 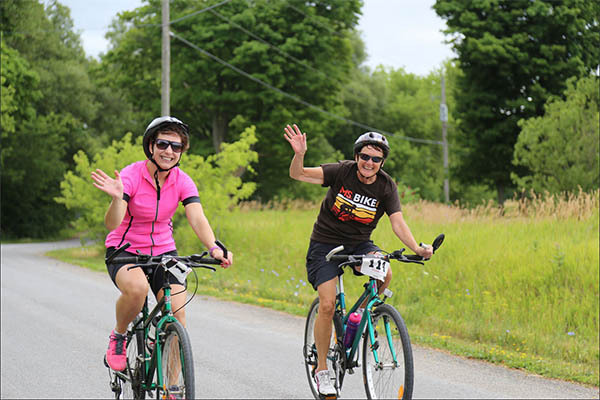 Since 1989, cyclists of all ages and fitness levels have joined together for the MS Bike every year. 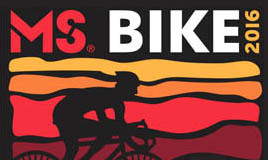 More than 10,000 cyclists participate in MS Bike, which has become the largest cycling series in North America. 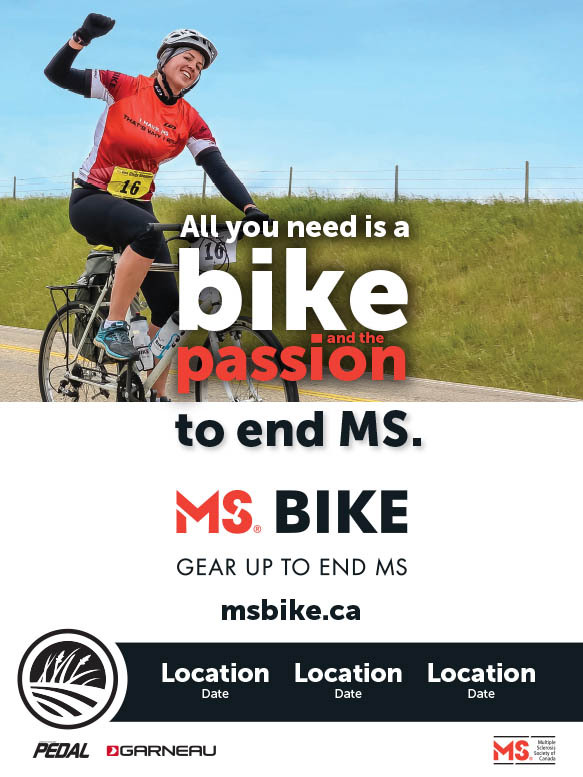 MS Bike provides Canadians with the opportunity to ride through scenic and often spectacular parts of the country while raising money to help fight Canada’s disease. There are 26 events across the country. The events vary between urban and rural road events. 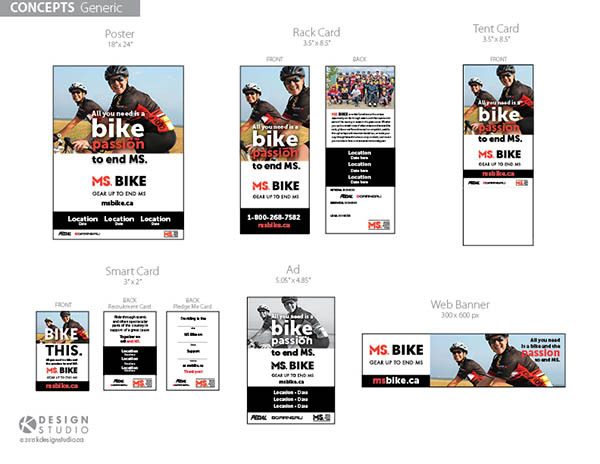 In 2015, K Design was very proud to be awarded our 4th project with MS Society. Our mission for this big client was to redesign all supporting graphics, and collateral for their events to help promote and continue to raise substantial funds. 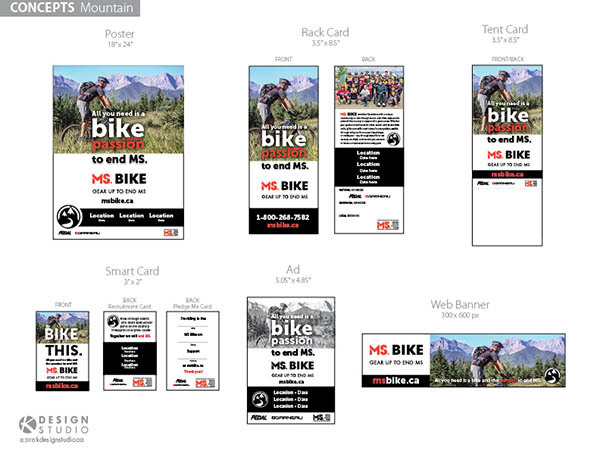 We needed to present the MS Bike brand consistently in our marketing collateral, as well as position MS Bike as a fun yet challenging cycling event. Our biggest challenge was that we needed to create 7 consistent design series, along with iconography, that would represent the different regions/events across Canada to help give each event more of a “local feel”. All designs were also required to be completed in English, French and various in Bilingual versions, and provide files that could be customized by each of the MS offices. We reviewed previous design series and creative strategies, timeline budgets, target market and brainstormed together on various branding ideas to ensure we found a unique, eye-catching, clear communicating, yet cost-efficient solution. We divided their regions/events into 7 categories: Forest, Mountain, Prairie, Urban, Waterfront, Wineries & Generic. An image search was then completed to find suitable photographic images for each region/event series, that would work in a cohesive series. Icons concepts were illustrated and tweaked until a full approved series were created. These were then applied to the initial English layouts for some of the key marketing collateral in various sizing, to ensure the designs would work across the board. Once approved, we then flowed the approved designs onto the remaining print items, and created templates for all 7 series to match. All were also created in French, and some items in bilingual versions. Over 200 layouts were created!! Social media items were next, then the fun design work for t-shirts. 1 generic background design was required with tagline, and needed to work for all regions as well as in French and bilingual. We aimed to create an exciting, trendy design so participants would want to rewear their shirts into the future, which would help promote the events. We provided the final design in 5, 3 and 1 colour options, to allow the different locations to select their desired layout pending their budgets. 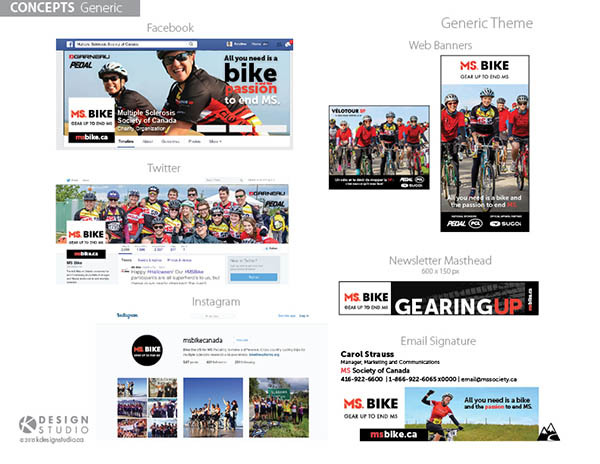 The new MS Bike marketing collateral was successfully released in 2015-2016 by MS Society across Canada for all events with mass publishing, online initiatives and videography. In 2016, K Design was approached to help enhance and build the current program further. 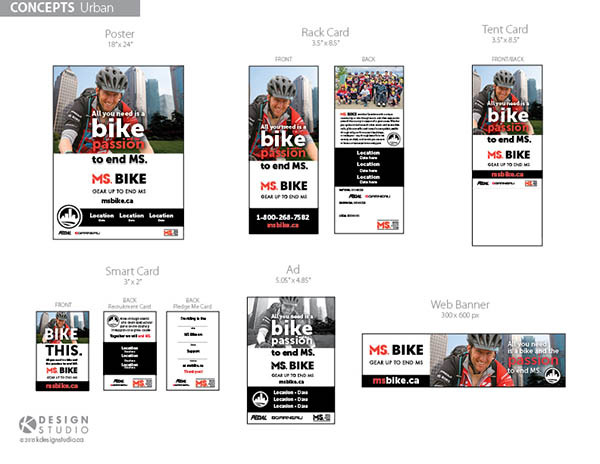 We created 2 additional images series that focused on flagship events utilizing images reflecting larger groups. 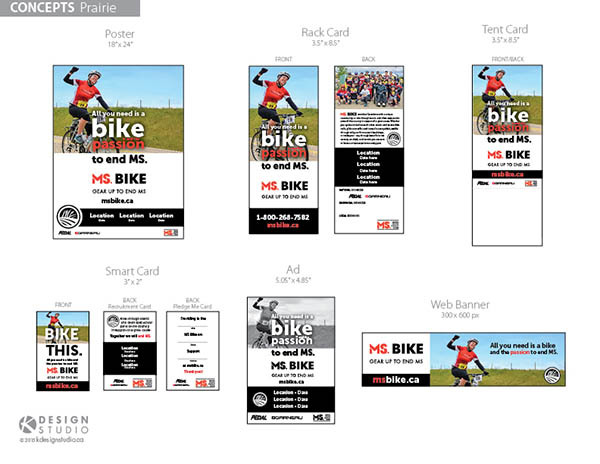 K Design is proud to be the graphic designing company and illustrator for this exciting MS Bike program. 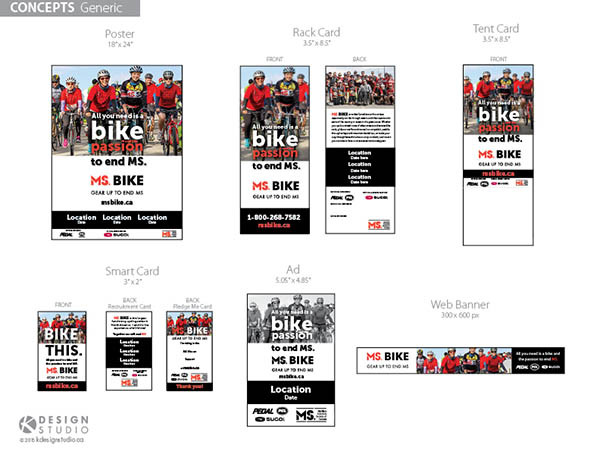 We believe in their initiatives, and love that we are helping to find a cure for MS. We hope our new creative for the MS Bike program continues to help it grow and build through the years. 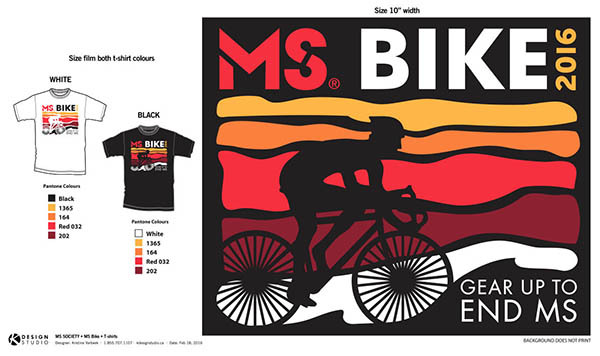 Gear up to end MS! All you need is a bike and the passion to end MS. Thanks Kris for all your great work!